Once in while we come across Apps in the Store that we feel is worthy of mention and want to share with you all. Since most of us here at McAkins Online have our roots in engineering and Builders world, something like this is worthy of sharing with you. Machineers App pride itself is challenging the engineer in you. It is not just another game, but something to tickle you brain cells. 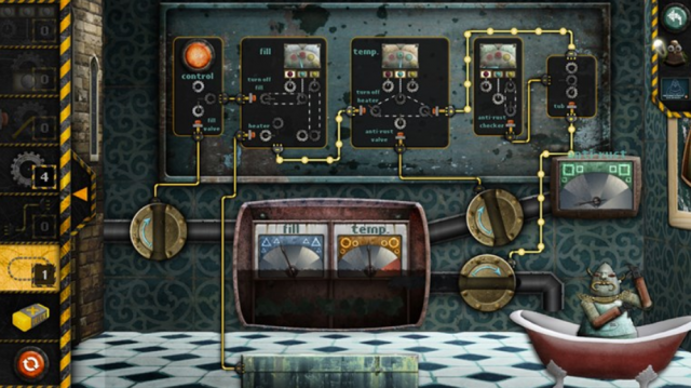 Repair gadgets and solve puzzles. You are an Apprentice Zola, learning to bow every machine to your will. You’re provided tools to work with to resolve issues. You get to grow in knowledge and become advanced to build your own vehicles etc. Spoiler: You can even build you own Tank! Machineers is not cheap at $9.00, but we are sure it’s worth all the fun. If you have a kid that is into mechanical engineering or a Lego buff, this is something to challenge him or her. Machineers is an award-winning independent puzzle game that teases your brain to think like programmers and engineers. You are Zola, an apprentice Machineer at Hayden’s repair shop in the rusty amusement park, Tivoli Town! With your toolbox full of gears, belts and electric wires, you help out the townsfolk by repairing their crazy contraptions. Each machine you fix brings you closer to becoming a true Machineer, and prepares you for your next challenge: the Vehicle Workshop, where you can design, drive, and refine your own car. Then it’s on to River City! With Tivoli Town now in better shape than ever, Hayden sends Zola to River City. Although the waterside town has its own (slightly loopy) Machineer named Harper, all isn’t well. Somebody is going around breaking machines, and it’s up to you to find out who and why. Guide Zola around River City, help the citizens and find what plagues them. · 5 episodes planned, 2 episodes currently available!